You may often see the synonymous "prullenmand". "Mand" literally translate to basket, where "bak" literally translate to "container/cask". – "Kun je het snoeppapiertje in de prullenbak gooien, alsjeblieft?" – "Onder mijn bureau staat een mooie roestvrijstalen prullenbak." – "Wie heeft er batterijen in de prullenbak gegooid?! Jij, Marc? – "Ben je betoeterd?! Batterijen breng ik altijd naar de blauwe recycle bak in de supermarkt!" – Prul: scrap, rag, piece of trash [noun] [de prul, de prullen]. – Mand: basket [noun] [de mand, de manden]. – "Liefie, waar staat onze picknickmand? Het is zulk mooi weer…"
– Bak: container, cask [noun] [de bak,de bakken]. – Papierversnipperaar: (paper) shredder [noun] [de papierversnipperaar, de papierversnipperaars]. – Vuilnis: garbage [noun] [het/de vuilnis, <no plural>]. – Troep: mess, rubbish, junk [noun] [de troep, <no plural>]. And of course ubiquitously on your desktop if you use a Dutch version of windows. I spotted a subtle error in the English above, but it’s worth pointing out because there is a clear difference between Dutch and English here. Brengen (always?) translates as ‘to take’. In English one never ‘brings one’s kids to school’ (unless you are a teacher there too) as the action of bringing in English is always towards oneself. Conversely, meenemen can often be translated as ‘to bring’, but not always! Sometimes it can mean ‘to take away’ or ‘to take along’. ‘Ik neem mijn kinderen naar school’, would be ‘I bring my children to school’, both which sound equally clumsy in both languages. I assume you are referring to “bring empty batteries” which should be “take empty batteries”? I think the point is even more subtle and to do with place/circumstance of conversation. So, if Marc and Sander meet AT the recycling centre the converstaion would be “Do you always bring your batteries to the recycling centre Marc?”, “Yes, I always bring them here!”. You would never say “Yes, I always take them here” in this situation. Same for the children/school example. But, if they met at a cafe for example and the subject of battery recycling came up (what a boring conversation! ), then the conversation would start “Do you always take your batteries to the recycling centre Marc?”. 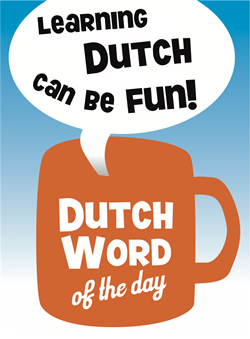 I have trouble understanding when to use “zijn,” “zitten,” and “staan” in Dutch, when in English, we’d just use “to be” (i.e., “zijn”). If so, do they have different connotations? If not, can you explain how to use “zitten” and “staan,” and even “zijn” in these situations? Thanks for your comment. However, I think you are further qualifying exactly the point I am trying to make. You bring batteries here as they are then coming towards where you currently are. If you are at home you take them away from where you currently are to somewhere else. I still often hesitate in conversation wondering whether I should be using ‘brengen’ or ‘nemen’ or ‘meenemen’. So, in conclusion 🙂 Have I used the right translation now? Je vertaling is helemaal goed!